Ranked with regard to a wide range of metrics — such as usability, key features, portability, and price — this top 10 list ensures that the beginner won’t have to worry about the quality of their choice in today’s market. Learning to play the synthesizer can be a daunting task for many first-timers. Just as frightening is the challenge of having to pick out the best synthesizer for beginners in what, at first, may seem to be an endless pool of overwhelming options. Want to jump right in and make a quick decision? We have also compiled a comparative table of our top 5 best recommendations for the beginner. Compact and portable, the Novation MiniNova generates a full and powerful sound. With 37 mini-keys, a 12-band vocoder, 18-note polyphony, and 256 innovative sounds, it is one of the best choices for those looking to get started quickly. What’s appealing about this model is that users can tune their creations in real time. Each voice can go through 5 different layers at a time. Endlessly customizable. Endless features can feel crowded for beginners looking for a simple instrument. 256 ready-made sounds to get started. 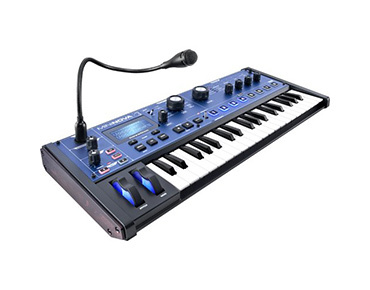 The Novation MiniNova synthesizer is a great fit for beginners who are aiming for a product that delivers much more than its other price equivalents. Constructed with the enthusiast in mind, the Roland System-8 Plug-Out synthesizer is perfect for beginners who are in it for the long haul. It delivers a wide palette of features such as the 64-step sequencer, 8 voices, and 3 oscillators to give an all-inclusive customization package. What makes it ideal for those just starting on this path is its semi-modular feature. In other words, this Roland synth comes with a preset patch work. On top of that, this is a standalone sound mixer which doesn’t need the support of a PC. Endlessly customizable. Not very portable for a 49-key design. Incredible sound range and depth for a performance synth. May be a bit challenging to pick up for beginners who want to start from scratch. 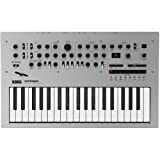 The Roland System-8 Plug-Out synthesizer is the best synthesizer for beginners who are looking for an instrument that will be useful long after their novice days. 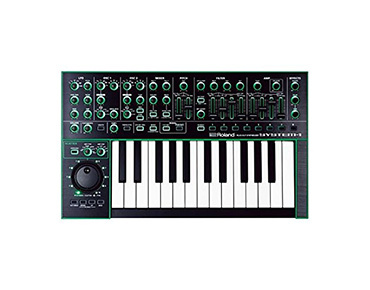 Suitable for beginners who have already figured out the kind of sound they are looking for, the Roland AIRA Series System-1 synthesizer delivers rich textured tones. Powered by 4 oscillators, an advanced arpeggiator, and independent high-pass filters, it is endlessly customizable. Moreover, its thin 25-key design is accessible for beginners. Portable and compact. Thin design may seem a bit crowded for the beginner. Incredible sound range, customization, and depth. 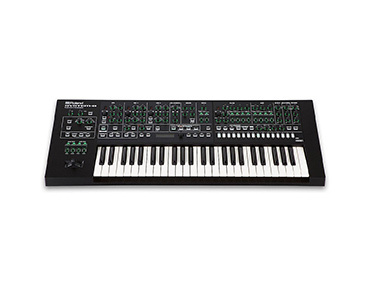 The Roland AIRA Series System-1 synthesizer is a great choice for beginners who are seeking a limitless sound range. 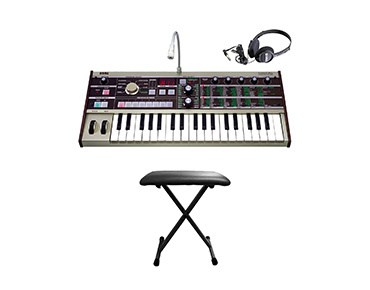 Aiming for the complete package, the Korg microKORG synthesizer offers 37 beginner-friendly, velocity-sensitive mini-keys, and an 8-band vocoder. With 128 presets and 6 optional AA batteries, it is both portable and incredibly customizable. It is best suited for beginners with an experimental edge. Portable and compact. Not the easiest to operate, but ideal for fast-learners. 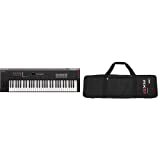 The Korg microKORG is the best synthesizer for beginners who are always looking to try out new angles on their music. This choice is also ideal for fast-learners. Immediately, the miniature Korg Monotron synthesizer stands out with its deceptive palm-sized packaging that can yield dynamic sounds. With a headphone jack for privacy, analog-style echoes, and built-in speakers and batteries, this is the best synthesizer for beginners who are unwilling to splurge on a larger, and costly, equivalent. With only 5 knobs and 1 switch, users get a powerful device that is a master of sound effects. The Space Delay feature puts you in control of some wicked cosmic sounds. Finally, the design was not forgotten either, sporting special paint that glows in the dark. 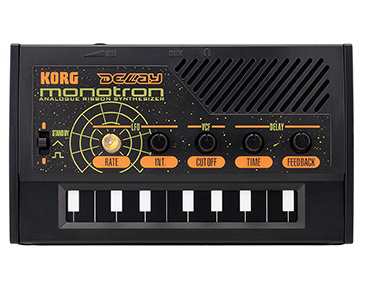 The Korg Monotron is the best synthesizer for beginners on a tight budget. Extremely portable (at only 8.3lbs) for the on-the-go musician, the Yamaha MX49 is the best synthesizer for beginners who simply want to plug in and play. 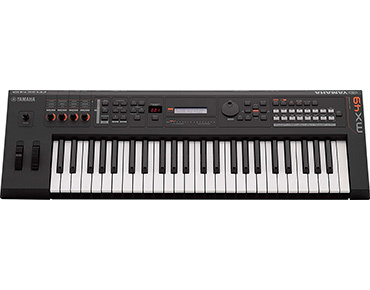 The 49 full-size, touch-sensitive keys work well with beginner accuracy. Moreover, with a 16-part multi-timbral, over 1,000 voices, and 128-note polyphony, it also matches compactness with a great sound. Under the blue tint, there are hidden powerful software, MIDI connectivity as well as VST and DAW controllers. Portable and lightweight relative to its packaging. Plastic construction has a generic feel. Rich sound of Pianos, organs, electric pianos, strings, brass, drums, and woodwinds. This unit requires a computer editor for users to control all its features. Both analog and digital compatibility. 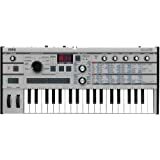 The Yamaha MX49 is the best synthesizer for beginners who are looking for a lavish sound and dedicated features. For such an extensive feature-packed design, the Roland GAIA SH-01 synthesizer has an unexpectedly beginner-friendly hands-on feel. The spacious control panel invites first-timers to delve right into it. With 37 keys and 64-voice polyphony, it has a distinctive sound which leaves nothing more to be desired. Users can modify the sounds with up to 5 layers such as delay, distortion, reverb, flanger or low boost. No big creation will vanish into thin air thanks to compatibility with USB flash drivers. Beginner-friendly control panel. Aftertouch is missing, and there are only 3 octaves. Portable and lightweight relative to its packaging. Endlessly customizable sound with a dedicated oscillator, amplifier, envelope, and filter. 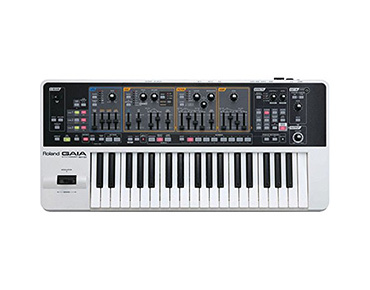 The Roland GAIA SH-01 is the best synthesizer for beginners who want to avoid crowded designs. 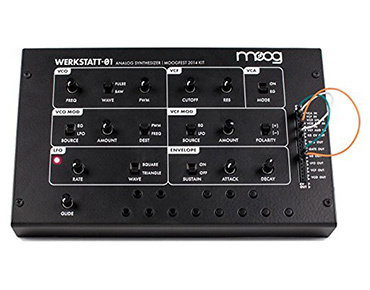 Specifically designed for beginners with little or no electronic background, the Moog Werkstatt-01 is easily customizable and extremely rewarding to assemble. Packed with exciting features such as the classic 4-pole Moog Ladder filter and a glide control keyboard, the Moog Werkstatt-01 is tailor-made for the curious novice. Easy to build and assemble with no prior knowledge. This is mostly designed for musical experiments and not professional performances. Do-it-yourself ethos allows for easy customization. There is more to learning than just plugging in the synthesizer and starting to play. 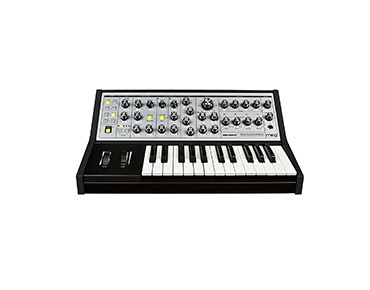 The Moog Werkstatt-01 is a perfect introductory step for newcomers with a knack for customization. The keyboard allows for endless hardware combinations, including a Rasberry Pi tablet. If you are seeking sound quality, the Moog LPSSUB001 Sub Phatty synthesizer is virtually peerless. Additionally, this 25-key analog synthesizer has an array of features that justify the handsome price — such as a multi-drive distortion section and a beginner-friendly customizable sub-oscillator. This unit needs only a plug and some setting tweaks to be ready for an entertaining performance. Rich sonic texture. Very costly. Little warm-up time needed to reach impressive oscillation levels. Not very portable at 16lbs. There are numerous knobs for simple programming. The Sub Phatty is the best synthesizer for beginners who are not afraid to invest in a high-end quality product. 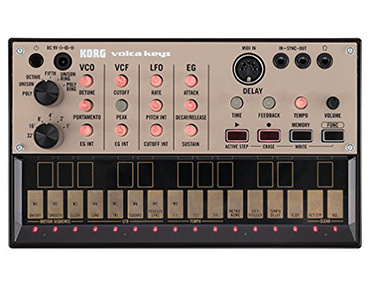 Few synthesizers give you the same value for your money as the Korg Volca Keys Analog Synthesizer. Its major reward is exemplified by the limitless number of key features at such a comparatively low price. For such compact packaging (listed at only a meager 0.72lbs), this 27-key 3-voice polyphonic synthesizer generates surprisingly rich and diverse sounds. Self-tuning customization. Cannot record in step-time. Multiple Volca series synthesizers can be used simultaneously. Can feel crowded with too many features. Portability is supplemented by built-in speakers and 6 optional AA batteries. It sounds great for such a miniature design. At a relatively low cost, the beginner gets to experience the very essence of traversing new sonic grounds with little expertise or adjustment. Purchasing a synthesizer that meets all your requirements is never easy. Each of the aforementioned products is a good choice for beginners who are looking for instruments with distinctive and specific qualities; from polyphony, compactness, and pricing to customization. Feel free to leave a comment about our choices and suggest any product that you think is the best synthesizer for beginners.